This page is based on information from Nobuaki Takerube and Kuromiya Kimihiko. Goita is a four-player partnership game from Ushitsu, Notocho-town, Ishikawa prefecture in Japan, where fisherman are said to have played it at least since the early 20th century. It is played with tiles that are similar to the pieces used for Shogi (Japanese Chess), except that the Goita tiles are all the same size and their reverse sides are blank, or with cards depicting Shogi pieces. Since the game is currently easier to obtain in card form, on this page I will refer to the playing pieces as cards. The objective is to get rid of your cards by matching the previous card played. After matching a card you play a new card for the next player to match. If you cannot or do not wish to play a matching card you pass. Because of this play or pass mechanism, I have classified Goita as a climbing game, although it is rather unlike other games in this category and may not be historically related to them. Its immediate ancestor seems to be the game Uke-Shogi, which was popular in Japan at the end of the 19th century. Another relative is the game Ao Kammuri, played with 100 poets cards. Goita is a partnership game for four people. It is played with cards or pieces which correspond to the pieces in a Shogi set except that there are only ten pawns, so that there are only 32 cards in all. Unlike Shogi pieces the Goita cards or pieces are all the same size and are all blank (or identical) on the reverse side. The table below lists the number of copies of each card in the set, its symbol, its name in Japanese and English and its point value in the game. *As in Shogi, the two kings have different symbols: 王 (ou: king) and 玉 (gyoku: jewel), the latter corresponding to the jewelled general in Shogi. Deal and play are anticlockwise. The Japanese company Grimpeur/Japon Brand has published Goita in the form of a deck of thick cards. The set also includes cardboard chips in denominations of 10 and 50 for scoring. In order to determine the partnerships and the starting player, one of the players takes the two kings and the two rooks and shuffles them. Each player takes one of the four cards and the two rooks are partners against the two kings. The player who took the real king (王) is the first dealer. The players take seats so that each player is sitting opposite his partner. Alternatively, partnerships can be determined using any two pairs of matching pieces. Those whose pieces match become partners and on player of the team that took the higher ranked pieces according to the above table is the first dealer. They can agree which of them will deal first or decide by playing Janken (scissors paper stone). The above procedure is only used for the first deal of a game. Subsequently the partners stay the same and the winner of the previous game is the dealer for the next. The dealer arranges the cards in a circle on the table, and then looks at the ceiling ('ago-noku') and closes his eyes. One of the opponents chooses a card and points it with his index finger and says 'this one!'. Then without looking, the dealer announces which card will be taken first relative to the indicated card: either the card itself 'that one!' or the card one or two places either side of it: 'one clockwise of it!'. 'two anticlockwise of it! ', etc. Now the dealer opens his eyes and takes the card corresponding to the announcements, for example the card two places anticlockwise of the card the opponent pointed to if that is the one he announced. Then each player in turn (going anticlockwise around the table) takes the next card in anticlockwise order around the circle and adds it to his hand, and this continues until all the cards have been taken. Each player now has eight cards. As in most card games players look at their cards but must not show them to any other player until they are played. First the players must check whether any of them has five or more pawns, in which case these pawns are shown to the other players. If a player has eight pawns, he wins the deal without play and his team scores 100 points. If a player has seven pawns, he wins the deal without play and his team scores twice the value of his eighth card. If a player has six pawns, he wins the deal without play and his team scores the value of his highest card. If a player has five pawns and his partner has the other five pawns, their team immediately scores 150 points and wins the whole game. If a player has five pawns and his partner has fewer than five pawns, the partner must choose whether to play or redeal. If he chooses to play, the holder of the five pawns must take them back into his hand and play proceeds as usual. If he chooses a redeal, there is no score, the tiles are mixed, and there is a new deal by the same dealer. If no one shows five pawns, the dealer begins the play. At your turn you must play either two cards or no cards. When two cards are played the second card is known as the 'attack' card. play a king (or jewel) if the previous attack card was not a lance or a pawn, and then play a new attack card. If three players pass in succession, the play comes back to the person who played last. This player now plays two more cards but does not have to respond to his own attack card. As all the others have passed he has the privilege of playing any card face down followed by a new attack card. All cards are played face up except for the first card played by the dealer and the first card played after three consecutive players have passed. You are never allowed to play a king as your attack card unless the other king has already been played face up or you have both kings in your hand. A consequence is that when a player attacks with a king all the other players must all pass, having no card that can match it, and the same player can then play two more cards. the two kings act as limited wild cards, which can be used to 'match' a 30 or 40 point piece or a Knight, but not a Lance or a Pawn. Traditionally, players play their cards in front of themselves, so that all the played cards can be seen (although the cards played face down remain unknown). You play your two cards in a column. The first card, which matches the previous card or is face down, is nearer to the centre of the table, and the second card, the attack card which the next player must match, is nearer to the player. Each player's columns are arranged from left to right so that everyone can see all the face up cards that have been played, as illustrated in the example below. 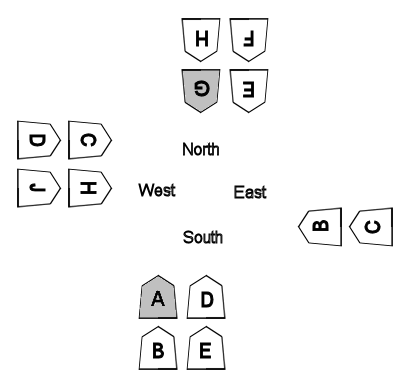 The cards were played in the order AB by south (the first card A played face down), BC by east, north passed, CD by west, DE by south, east passed, EF by north. West, south and east all passed then, so north was able to play another pair of cards GH with G face down, then HJ by west, and so on. As soon as a player plays his last two cards, the deal ends. The player who managed to play all his cards wins the deal. The winner's team scores the value of the last card played, that is the winner's final attack card. If a player wins by playing his last two cards after three passes, and these last two cards are equal, he shows them both and the team scores for both cards - i.e. twice the value of the last card. The winner becomes the dealer of the next hand. Each team keeps a cumulative score, either with chips or on paper, and the first team to achieve a score of 150 or more wins the game. This game, also known as Imo Shogi, seems to have been popular in the late 19th and early 20th century and is a possible ancestor of Goita. So far as we know this game is no longer played and the surviving descriptions are brief and somewhat ambiguous, so we cannot be completely sure how it was played. The game was described in 1927 under the name Imo Shogi in a judicial document Tobaku ni kansuru chôsa (A Research into Gambling). The deck consisted of 40 cards: 2 Kings, 2 Rooks, 2 Bishops, 4 Golds, 4 Silvers, 4 Knights, 4 lances and 18 Pawns. Some decks have 20 pawns, so 42 cards in all. It may be that the 40-card deck was used by for four or five players and the 42-card deck by six or seven players. The cards were distributed equally to the players and the dealer began by playing one card. Play was anticlockwise and each player in turn could either match the dealer's card or pass. The play apparently went around the table as many times as necessary until all players but one passed in succession. The player who had played the last card then played another card from hand, and again each player in turn had the opportunity to match this card. Play continued in this way until one player managed to play his last card and won. It is not quite clear whether a player who held a matching card was obliged to play it or was allowed to pass. It seems likely that passing when able to play was not allowed, otherwise a player with a single matching tile would very often pass, hoping that some other player would match the tile first and aiming to be the last to play a matching tile, but the account gives no hint of this practice. In the Uke-Shogi section of his book The Card Games of Asia and Their Cards (2000) chapter 47, p208 Umebayashi gives two variants, which may have been inspired by an analogy with Goita. The cards have point values: King 200, Rook 100, Bishop 50, Gold or Silver 10, Knight or Lance 5, Pawn 1. When a deal ends, the losers pay in proportion to the number of points remaining in their hands. Kings can be played any time, being regarded as equal to the card that is to be matched. In A History of Chess (1913), p147, H.J.R. Murray describes a slightly different version of Uke-Shogi for two players: "A certain number [of chessmen] are dealt out, and the first player challenges his opponent to pair a named piece in his hand. If he succeeds, the move passes to the opponent; if he fails, the first player throws out this piece and challenges with a second piece, and so on. The player who first succeeds in getting rid of his hand wins." This differs from the above version and is more similar to Goita in that as soon as a piece has been matched, the pair is thrown out and the player who played the matching piece plays a new piece.